We spent 36 hours testing and researching 20 different brands and types of beach towels and found that absorbency, size, and color or style were most important to consumers. Utopia Towels Premium Beach Towels scored high marks above the competition in all categories and is our overall top pick. These color, 100% cotton towels measure 30” x 60” and come in a variety of bright colors that will easily stand out on the beach. Utopia Towels premium beach towels are super soft, very absorbent, they dry fast, and are machine washable for easy upkeep. A quality beach towel is one of the essential things to have when you head out to enjoy the sun and sand. Beach towels are very different from bath towels in that they are much larger and designed to double as a place to lie out in the sun or sit relaxing. Most bath towels are not large enough to do this. They are typically made from different materials than regular towels, that are made to repel sand, odors, and stains. They are very good at absorbing moisture and are usually thinner than bath towels. A high quality beach towel is very durable and come in a huge variety of brilliant colors and styles that can match any personality. We have put together three reviews of the top rated beach towels on the market along with an informative buying guide that will give you all the knowledge you need to sort through the numerous styles and brands so you can choose a beach towel that will give you exactly what you are looking for: a comfortable spot to lounge in the sun while providing you with plenty of drying ability and style as well. Utopia Towels produce some of the best quality beach towels on the market. These 100% combed cotton towels measure a whopping 30” x 60” and come in a variety of brilliant colors that really stand out. The cheery striped patterns look great on the sand and make it easy to spot where your stuff is. These great beach towels are absorbent, super soft, and dry fast once they are damp. 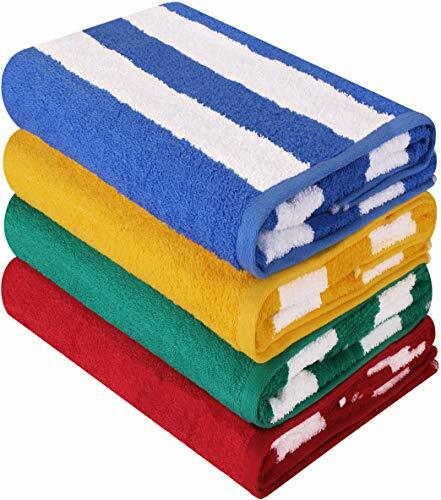 You get four brightly colored towels in this pack in 4 different colors with a striped pattern. The colors hold up well in direct sunlight and are machine washable in warm water and can be tumble dried on low. These towels have hemmed edges that are professional done for durability and longevity. Even after many washes you can count on these towels remaining soft. They make excellent gifts for beach loving family and friends too. 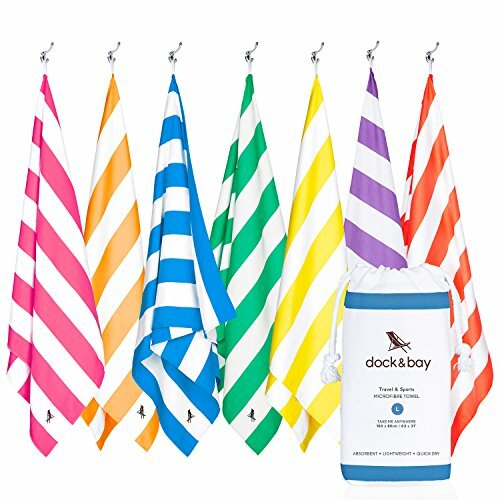 This sand free towel by Dock & Bay is perfect for beach goers, swimmers, surfers, and others who regularly engage in water sports. The Dock & Bay beach towel is made from microfiber that feels very different from a regular towel. It is very smooth to the touch and is highly absorbent and dries 3 times faster than cotton towels. These premium beach towels come in many different sizes to accommodate a variety of needs. The X-Large size measures 78” x 35”, large measures 63” x 31”, and the round measures 75” in diameter. Each towel folds down compactly to fit into the included carry pound that makes this towel perfect for traveling. One of the popular features of this beach towel is that sand will not stick to it the way it does regular towels. Just shake it out and the sand is back on the beach where it belongs. Keep in mind this beach towel is not cotton, so it will feel completely different than a cotton towel. The texture is more like a shammy. It works remarkably well for drying you off and providing a great place to lie on the beach. Your satisfaction is important to the Dock & Bay Company. They offer their customers a satisfaction guarantee. If you don’t love it, they will give you your money back; just decide within 30 days. There is also a 12 month warranty included. Laguna Beach Textile Company produces this plush beach towel that will make it hard for you to ever want to use another kind of beach towel again. The three different color selections are elegant and stylish so you can match your design style easily. The classic striped design gives the towel a very high end look that fashion-conscious people look for. The Laguna Beach Textile Co. beach towel is made from 100% cotton making it super soft and comfortable to lie on while you are enjoying the sun and sand. The high thread count on this towel makes it thicker than ordinary beach towels which allow it to absorb more moisture quickly and efficiently. You can wash the Laguna Beach Textile Co. beach towel in the washer so it is easy to keep clean and looking great. This lightweight, less than 2 pound towel provides plenty of coverage for all your water related activities. Other colors available are red, white, and blue and midnight blue and sea foam. The three top rated beach towels featured above are high quality beach towels that will provide you with everything you are looking for in a beach towel. All three brands are soft, absorbent, and perfect for long days at the beach, pool, or on the boat. One of the great things about these beach towels is that they are designed for the beach so they are resistant to sand clinging and sticking to them. If you have ever used a regular towel at the beach you know how hard it is to get rid of lingering sand stuck in the fibers. These towels don’t have that problem. Taking the time to get prepared for beach or pool outings by having the perfect beach towel on hand allows you to lay out in the sun, dry off when you come out of the water and enjoy the day without worry about the towel not being good enough to meet all of those needs you have. Once you are ready to purchase a beach towel, you could become overwhelmed with the dozens of choices you have available to you. Start by taking a look at the three top-rated selections we have listed above. If none of those three are what you are looking for we have listed several more quality beach towels for your consideration. Buying a beach towel may seem like a simple task but there are many different styles, colors, brands, and absorbency levels to consider that can be downright confusing when you are trying to decide on one beach towel. This guide will help you choose the right beach towel for all your water activities. Factors such as the material used to the size of the towel can affect your experience so be diligent now in finding exactly what you are looking for and then purchase with confidence. Take the following points into consideration as you sort through the different selections available. Beach Towel Material – Most of the beach towels on the market are made from cotton material of some kind but there is a relatively new material being used that feels totally different than the typical beach or bath towel. Cotton is a very popular material but it has a very luxurious feel to it. Many high end spas and hotels use cotton towels for their guests. Cotton absorbs water well and is durable too. 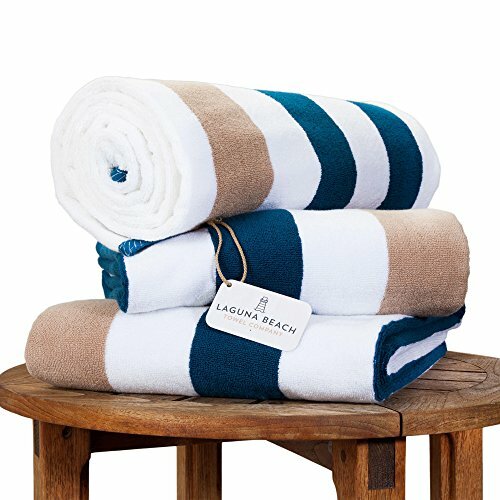 Microfiber beach towels are fairly new to the scene and provide a smooth, unique feel to it that is nothing like cotton yet it still feels good to the touch. Microfiber towels are usually sand resistant so you can just shake it all off and not worry about particles sticking to the fabric and ending up in your washer or on your wet skin. Mirofiber towels which are usually nylon or polyester, produces a towel that is thinner than regular beach towels. Beach Towel Sizes – Beach towels come in a variety of sizes but in general they are larger and wider than regular towels so they can double as beach “blankets” and provide a place for you to lie out in the sun or sit and enjoy the waves and scenery. The most common sized beach towel measures 30“x 60”. If you are tall you may want to look for an oversized version or a two-pack of beach towels so you can use them both for the most comfort. Circle beach towels are a new shape that people are enjoying these days although they are not super popular yet. Circle beach towels are measured by diameter and allow more people to sit on them when they are large enough. A diameter of 60” or bigger is a good size to focus on. This typically allows doer 3 to 4 people to sit on the blanket at the same time. Thickness – How thick do you like your beach towel? Think about how you will be using your towel. If you will be sitting on a rocky beach you will want and appreciate a thick, cushiony towel. If your favorite spot is just sand you can handle getting a thinner towel with no repercussions. Towels are another product that has a thread count. The average beach towel can have between 350 to 450 gsm. If you are looking for high end beach towels it can have as much as 600 to 650 gsm. The larger the gsm the softer and thicker the towel will be. Absorbency – If a beach towel can’t dry your skin properly it doesn’t matter how bright the colors are or how accurate they are. Being absorbent is a beach towel’s job so it is important that it be made to be absorbent. Also look for beach towels that offer quick drying technology. If it doesn’t dry quickly you could easily be sitting on a wet towel. This can draw sand fleas which will all but ruin your beach visit. Thinner beach towels will not be as good at drying you off as the thick styles will be. Although the absorbency takes a hit, it gains marks for fast drying. Style and Color – Style isn’t the most important thing you will consider when search, many people have it on their list of things to consider. Some brands offer vibrant, colorful choices while some may be more classic and understated. Look at the photos of the beach towels you are interested in and see which colors appeal to you the best. Certain beach towel colors will hold up better than others. A darker color beach trowel will show stains and dirt a lot less than a white or striped towel will. The downside to a darker towel is that it will absorb the heat from the sun faster and be a lot hotter to sit on. Think about these things when choosing the color beach towel you prefer. Cleaning the Towel – How easy a beach towel is to get clean is a pretty big deal with most consumers. Check out the cleaning instructions on the beach towels you are interested in. The majority of them will be machine washable, sometimes just in warm water, and can be tumble dried on low. Avoid using extreme heat to wash or dry your towels and don’t use bleach either since that will weaken the fabric. Microfiber, cotton, and synthetic beach towels are best air dried on the line because they can lose their softness when dried many times in the dryer. Price – You don’t have to pay a fortune to get a high quality beach towel but they will typically cost a little more than regular beach towels and bath towels. A good quality beach towel can run anywhere from $25 dollars and up. Many beach towels are sold in packs or 2 to 4 for a set price which gives you a good deal on a multiple towel purchase. Things that will determine the price of your towel include the brand name, material used, the size of the towel and even some color schemes. You want your beach towels to last a few years so spending a little more to ensure that longevity is well worth it. Spending more will also provide you with a towel that is soft, durable, and so absorbent that you will never want to put it down. The right beach towel can make a good day at the beach great, especially if it is big enough to lie on without getting sand on you, it’s super soft and comfortable, and is great to look at. Beach towels are perfect for many water activities and work really well to get you dried off and ready for relaxation. With so many great choices on the market for beach towels it can be a real challenge to choose just one. The purpose of this guide and the reviews we have provided of the three top rated beach towels will help guide you through all of the different selections so you can see which ones fit your needs the best. Make sure that you know what you are looking for in terms of thickness, size, and color before you start shopping. Some beach towels focus on being super absorbent; others are designed to be sand resistant. What your feature goals are will determine which beach towel will work the best for your preferences and needs. If none of the three top rated beach towels appeals to you, don’t forget to check out the other 7 we listed in the summary section. With so many different choices to look at, you will definitely be able to find a quality beach towel that will be everything you want it to be. The information in this guide has shown you the common features that many beach towels will have and what to look for within each of those features. You do not have to settle for any old towel. Take the time to do your homework on the brands and materials and take a look at customer comments as well. You can get a lot of information by reading what others have to say that have purchased the beach towel you are interested in and used it. Look for beach towels that have higher star ratings and lots of positive comments so you can get that inside track on what the towel is really like once you start using and washing it. All of this knowledge will help you choose a beach towel you can feel confident about so you know your money was well spent.